This past weekend the Texas Archeological Society held its 85th annual meeting in San Marcos, Texas, and the Eagle Nest Canyon project was well represented. Steve Black and I began the symposium with a 40-minute introduction highlighted by a series of animations created from the 3D models we have generated from our work thus far. The six animations, such as that of Eagle Cave shown below, were narrated and aided by additional images. Eleven additional speakers and ENC research team members rounded out the ENC symposium (abstracts below). We also created a poster (Skiles et al. Eagle Cave_TAS2014 Poster) to highlight the excavation methodology we are using at Eagle Cave. All of the presenters gave excellent presentations, and we are looking forward to learning from the ongoing analyses. Stay tuned for new blog posts, and we will have another symposium at the Society for American Archaeology Meeting in San Francisco next April! Eagle Nest Canyon from the air. UAV Imagery courtesy Mark Willis. 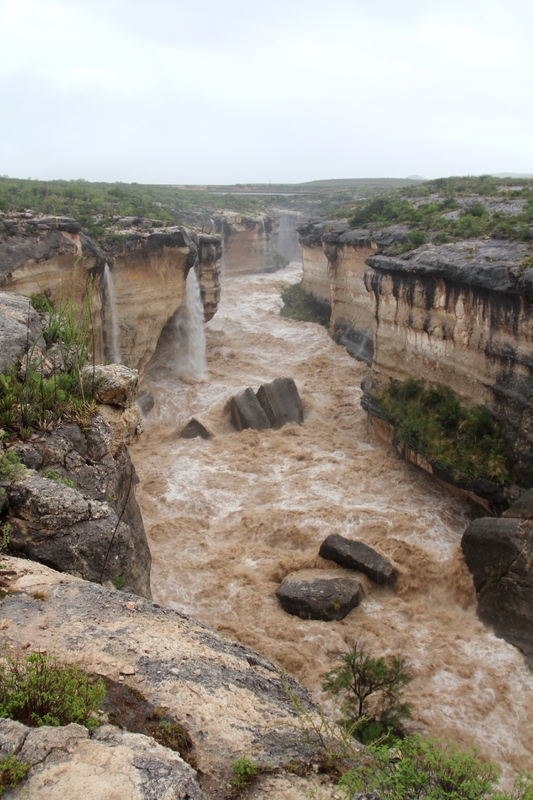 This presentation introduces the symposium and the 2014 Expedition by the Ancient Southwest Texas Project of Texas State University, as well as sites within Eagle Nest Canyon with an animated overview of the canyon. The ENC Expedition has three overarching research goals: 1) understand the human and natural history of the canyon; 2) share what we learn; and 3), conserve the archaeological record for future generations. From January through June a small core research team worked side-by-side with landowners Jack and Wilmuth Skiles and dedicated volunteers, collaborators, and partners to further these goals. Our strategy is to apply state-of-the-art, multi-disciplinary research methods to documenting and sampling the complexly and deeply stratified deposits at two dry rockshelters with extremely well preserved organic remains and two shelters with shallow overhangs. Our guiding motto “Low Impact, High Resolution” characterizes our approach. 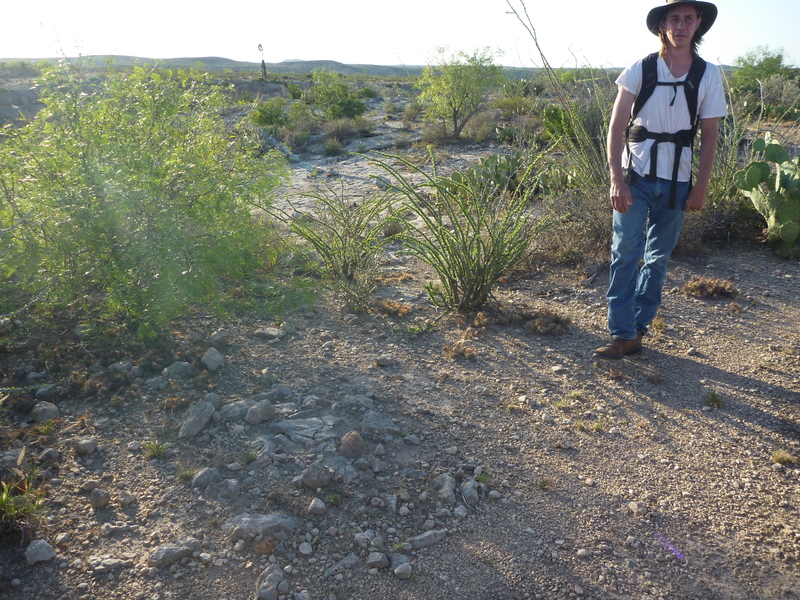 Matt Basham describing a small upland burned rock feature on the Canyon Edge. The canyon edge is a common geographic zone throughout the Lower Pecos Canyonlands of southwest Texas. The edge around Eagle Nest Canyon, in particular, was used by prehistoric people for thousands of years. Archaeological surveys of the area, most recently by the Ancient Southwest Texas Project of Texas State University, have documented a variety of sites, features, and artifacts that have helped reveal the length and scope of human activity in this unique geographic setting. This paper will present an overview of the canyon edge around Eagle Nest Canyon. A brief description will be given of each site in this zone. In addition, the radiocarbon dates of several burned rock features and diagnostic projectile points will be discussed that are relevant to determining the length and scope of human activity on the edge of Eagle Nest Canyon. 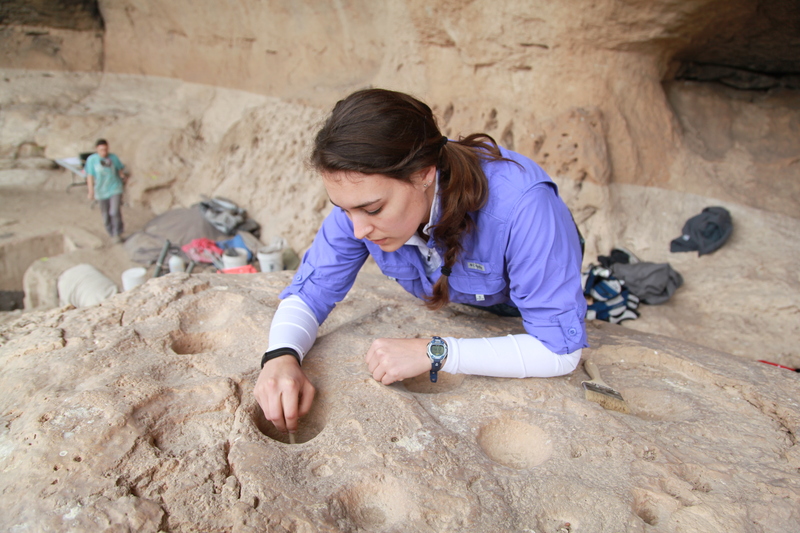 Stephanie Mueller excavating PS05 in Eagle Cave. In a race to be among one of the first institutions to acquire artifacts from the earliest known culture in Texas at the time, the Witte Memorial Museum sent out fifteen known expeditions to archeological sites throughout western Texas within the first two decades of its institutional history. At least five of those expeditions ended up in Eagle Nest Canyon. The first of those was a scouting expedition in 1922 to Eagle Cave (41V167). Four other expeditions followed in the 1930s where the museum conducted excavations in Eagle Cave, Jacal Shelter (41VV674), and other sites in the vicinity of Langtry, Texas. This paper provides an overview of the known Witte expeditions to Eagle Nest Canyon and reports recent findings of one of the museum’s campsites utilized during the later expeditions. Tina running the TDS in Eagle Cave. Eagle Cave (41VV167) is a large dry rockshelter with deep stratified deposits spanning the Early Archaic through the Late Prehistoric periods. My thesis research focuses on the deposits in the northern sector of the shelter sampled during the 1963 excavations by UT-Austin and again a half century later by Texas State University in 2014. My goal is to use multiple lines of evidence to evaluate the natural and cultural formation processes that resulted in the complexly stratified, culturally rich deposits present in Eagle Cave. By using data derived from stratigraphic documentation, geoarchaeological sampling, artifact analysis, macrobotanical and faunal identification, constituent size distribution, and radiocarbon dating, I hope to develop a viable protocol for understanding the site formation processes evident at Eagle Cave and many other Lower Pecos rockshelters. This presentation summarizes the microstratigraphic approach taken during the 2014 field investigations and highlights methodological and analytic challenges. Bryan standing in front of PS3 in Eagle Cave. Throughout the ENC 2014 project we used Structure from Motion to document and photograph each excavation unit-layer. 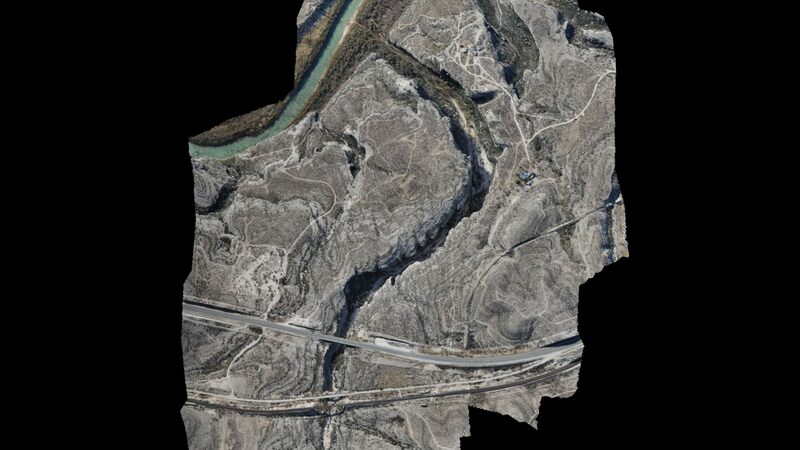 Using the photogrammetry software, we are able to create digital surface terrain representations and digital elevation models (DEMs) of excavation unit-layers with sub-millimeter accuracy. In turn, each DEM can then be manipulated with ArcGIS in such a way to not only show and measure the precise opening and closing dimensions of an excavated unit, but also calculate total volume of material excavated—no matter the shape or size. Additionally, these digitally recreated excavation layers can be overlaid onto a unit’s stratigraphic profile in ArcGIS to compare the pre-defined strata of a profile to what was actually excavated and seen in profile view. Together by using ArcGIS and Structure from Motion photogrammetry software, the ASWT Project has begun extracting excavation unit data in a new and potentially more efficient way. The Macrobotanical team examining a large grinding slab in Eagle Cave. Abundant well-preserved plant remains recovered from sheltered sites in Eagle Nest Canyon illuminate ecological interrelations between the prehistoric site occupants and the surrounding natural landscape. These materials have implications regarding: preferences and selection of local plants for food and fuelwood; behavioral patterns of food plant harvesting and processing; modification of plant parts into material culture such as tools, cordage, and textiles; seasonality of site use; and the nature of past environments surrounding the shelters at time of site occupation. In this paper we present the preliminary results of ongoing archaeobotanical analysis of plant materials recovered from Kelley Cave (41VV164). In particular we focus on evidence from Feature 4, a large pit thought to represent an earth oven facility with a complex history of use and abandonment. 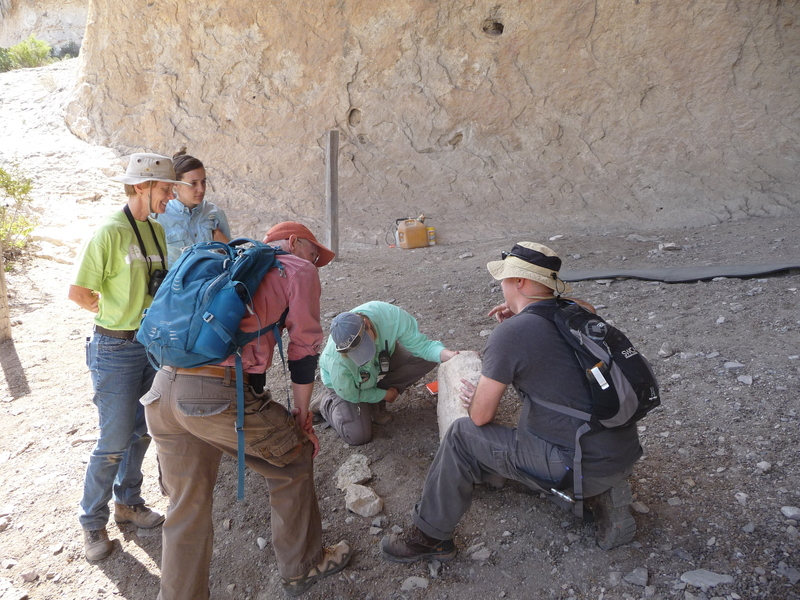 Charles discussing excavations in Eagle Cave with Matt Larsen and Lindsay Vermillion. Of the Eagle Nest Canyon sites, Skiles Shelter is located closest to the Rio Grande and is the most at-risk for damage from flooding. Dan Rodriguez tested Skiles during the 2013 Texas State field school. The Ancient Southwest Texas Project greatly expanded on this initial work in 2014. Excavations this past spring at Skiles Shelter focused on three main research objectives: 1) understanding the site’s depositional history; 2) quantifying how much earth oven baking occurred there; and 3) relating the prehistoric record at Skiles to the other sites within Eagle Nest Canyon. 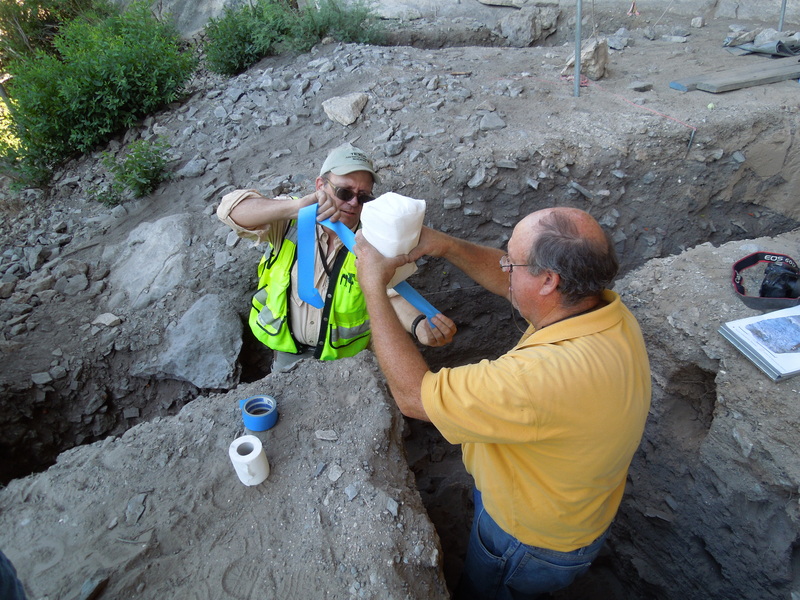 Excavations were conducted using similar methodologies employed by ASWT at other Lower Pecos BRM sites, with a focus on collecting samples for radiocarbon dating, geoarchaeology, archaeobotany, and zooarchaelogy. This presentation will highlight preliminary results of the excavations and ongoing analysis. Amanda recording the bedrock features at Skiles Shelter. Bedrock features are a common archaeological occurrence in the Lower Pecos Canyonlands. These occur in a wide range of forms, from polished “slicks”, cupules, and small grinding facets to large, deep, well-developed mortar holes. Even though relatively common, bedrock features, and ground stone in general, have received very little directed research in the region. This paper focuses on *** bedrock features from five sites within Eagle Nest Canyon, and highlights ongoing research examining bedrock feature morphology. On-site morphological and macroscopic use wear attributes were recorded for each individual work station, and Structure from Motion photogrammetry was employed to further assess this feature type. Additionally, experimental residue samples were collected from several features in Skiles Shelter. This project will contribute to creating a typology of bedrock features for the region and a base line data set for future studies to expand upon. Charles Frederick and Ken Lawrence removing a micromorphology sample from Skiles Shelter. This presentation summarizes the 2014 geoarchaeological investigations conducted at Kelley Cave (41VV164), Skiles Shelter (41VV165), and Eagle Cave (41VV167) and highlights elements of the ongoing analyses. Research begun in 2013 at Kelley Cave and Skiles Shelter was expanded and new work was begun in Eagle Cave. 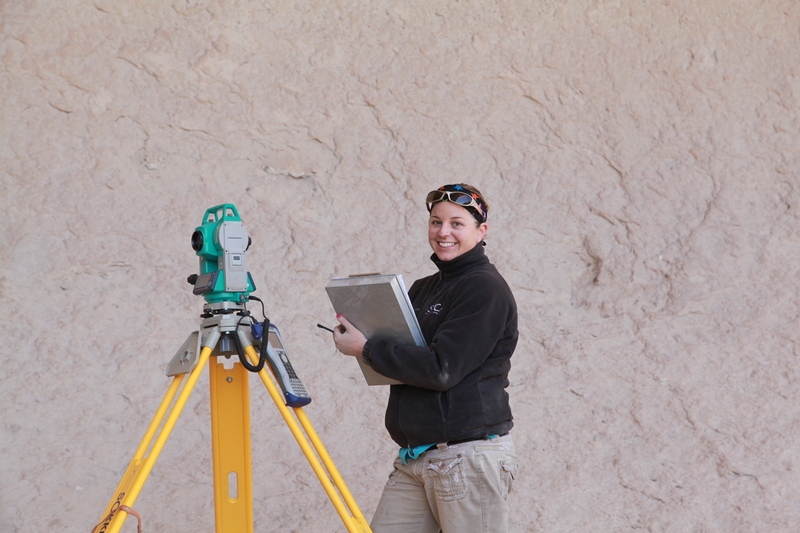 The geoarchaeological investigations have encountered new problems, opportunities, and several surprises. The data obtained from each site includes micromorphological samples, high-resolution cube samples, and bulk matrix samples. This presentation discusses the preliminary results of these investigations, their interpretations, and how they correlate to the cultural deposits from the excavations. 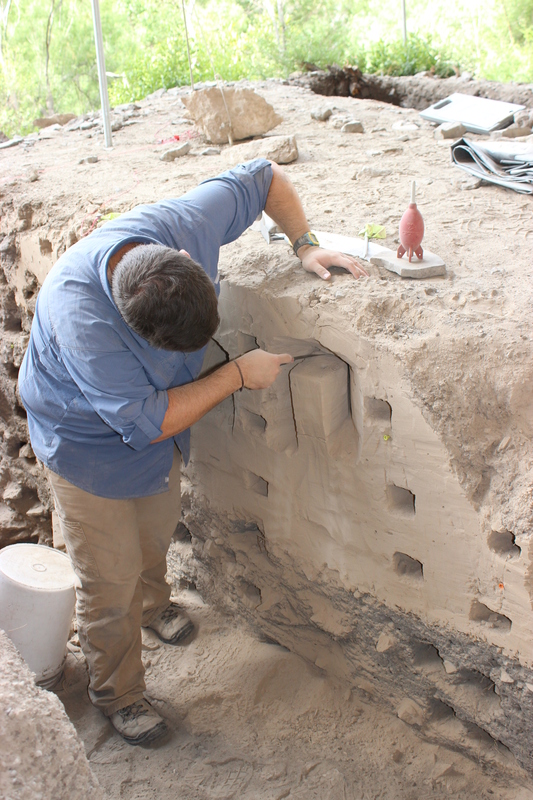 Jake preparing a micromorphology sample from Skiles Shelter for extraction from the wall. Documenting stratigraphic exposures can be exceptionally difficult within the dry rockshelter deposits from sites within Eagle Nest Canyon—especially when dealing with the micro-stratigraphy often visible. Fine dust, carried by wind or cascading down a profile face, threatens to obscure these sometimes delicate and subtle lamina we seek to record. In order to gain a clearer understanding of the site use and depositional history, we have undertaken an ambitious micromorphology collection strategy for all the sites within ENC. Micromorphology blocks are carefully removed from exposed profiles, and imbedded within a polyester resin which allows for detailed analysis back in the lab. These block sampling columns provide high resolution vignettes into the natural and anthropogenic depositional processes at work within each of the rockshelters. This paper is an overview of the methodology and analysis of micromorphology samples taken from Profile Section 5 in Eagle Cave. Eagle Nest Canyon flooding during the June 20th flood. Although presently a desert environment, extreme flood events are part of life in the Lower Pecos Canyonlands. This paper examines two such flood events, one preserved in the deposits of Skiles Shelter and Kelly Cave, and another that occurred on June 20th 2014. These events provide examples of catastrophic floods that punctuate the sedimentary records in the shelters and contrast with the more incrementally formed deposits that occur in association with human activity in these settings. The presentation also examines the issue of which process is more formative in the local landscape: rare extreme magnitude flood events or low magnitude but higher frequency floods. 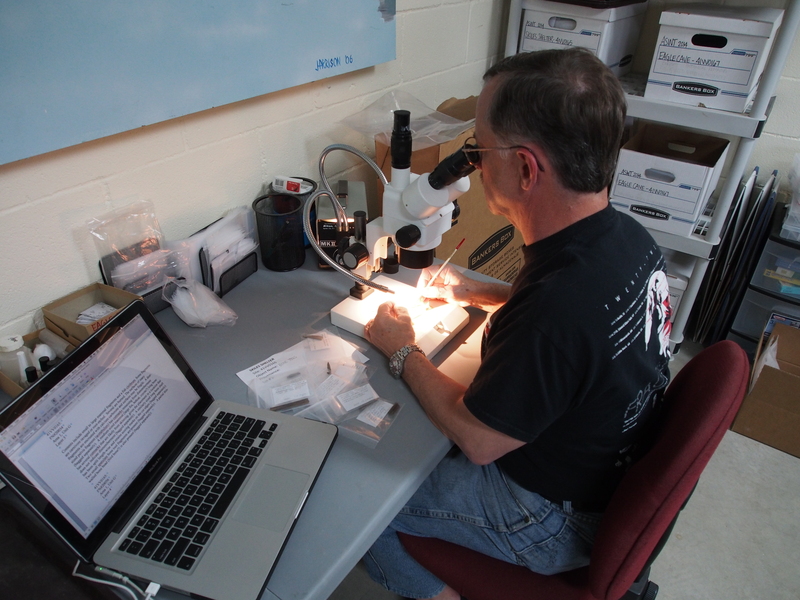 Dr. Chris Jurgens studying faunal remains under a microscope. 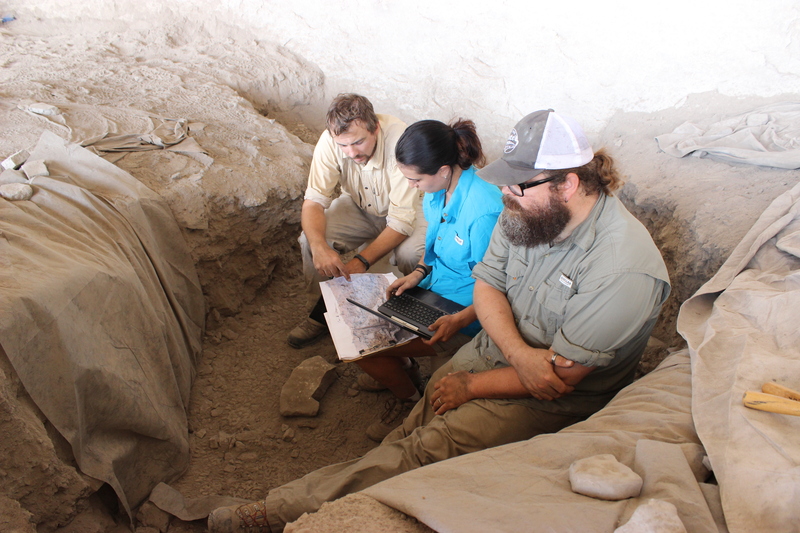 Distance and a decade of life separate the subjects of doctoral zooarchaeological research and current Eagle Nest Canyon research efforts. The author returns to Lower Pecos research as an extension to his earlier doctoral research. 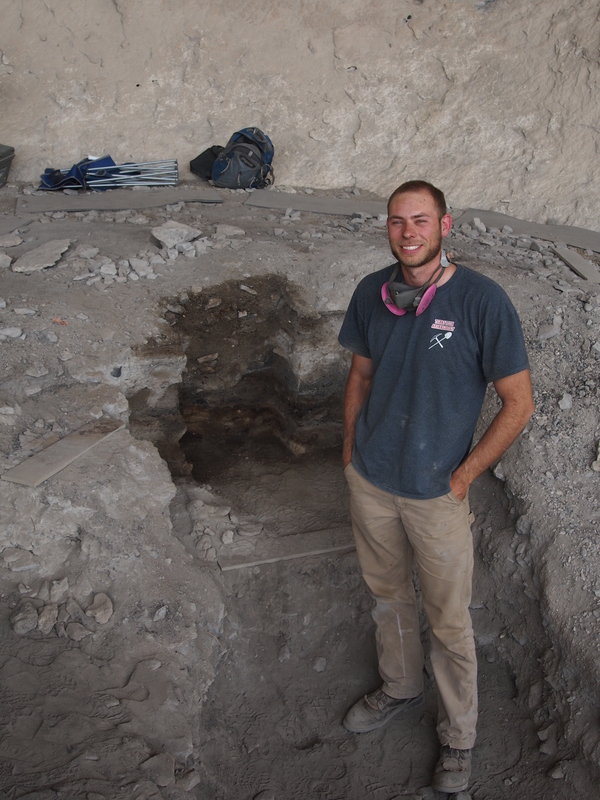 Zooarchaeology and bone technology was the focus of the earlier research at Arenosa Shelter (41VV99), the deeply stratified site located in the Pecos River canyon 25 km (15 miles) southeast of Eagle Nest Canyon. Analysis results from Eagle Nest Canyon sites are comparable with those from the upper strata at Arenosa Shelter. Preliminary analyses of faunal materials from the Eagle Nest Canyon sites reveal patterns that compare favorably with those at Arenosa Shelter. The patterns are similar for skinning, butchering, and bone fracturing; bone tool and ornament manufacture; and subsequent use wear. Formal and informally manufactured tools are present in both locales. Tool forms are very similar. Informally manufactured tools are present at both locales. This entry was posted in Structure from Motion. Bookmark the permalink.